The 2011 Chicago Auto Show is underway and Dodge got the ball rolling early by letting the 2012 Dodge Charger SRT8 out of its cage. Man this thing looks mean! A few people have likened its looks to that of a GT-R but personally I think this car looks way tougher than that. 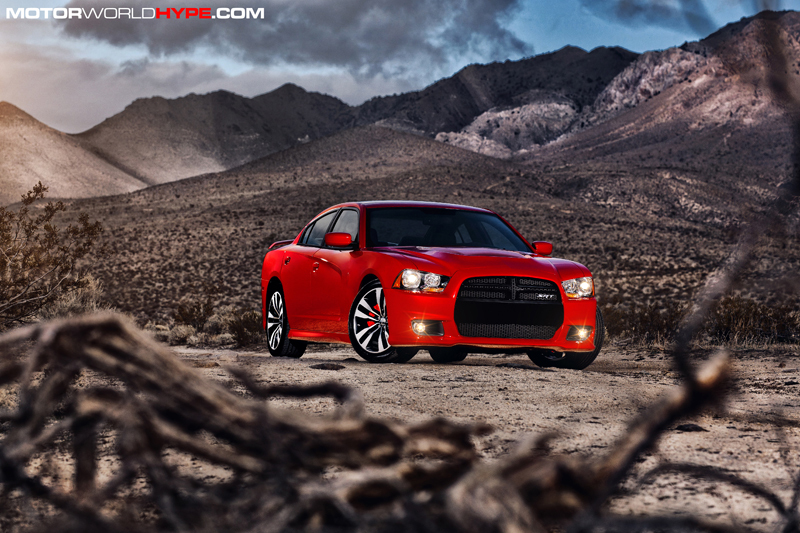 If Chuck Norris was a muscle car, he would be the 2012 Dodge Charger SRT8. Every time I look at this thing I feel like I’ve been roundhouse kicked in the face. The new SRT8 is sporting an equally new 6.4 liter 465HP HEMI V8 with 465lb-ft of torque on tap and all of that power is forced out through a 5-speed automatic transmission which can be controlled via “auto stick” or paddles behind the wheel. To me the notion of paddle shifters in a muscle car seems odd but I’m not one to argue with something as mean looking as this. To add to the rough looks Dodge throws in a set of forged aluminum 20 inch wheels with the SRT logo engraved in the spokes. To help smooth out the bumps Dodge also includes an adaptive suspension and in an effort to keep fuel costs down the new SRT8 also comes with the FST (fuel saving technology) that runs the car on just 4 cylinders until you need the power. Bottom line? Other muscle cars should be afraid…very afraid.. 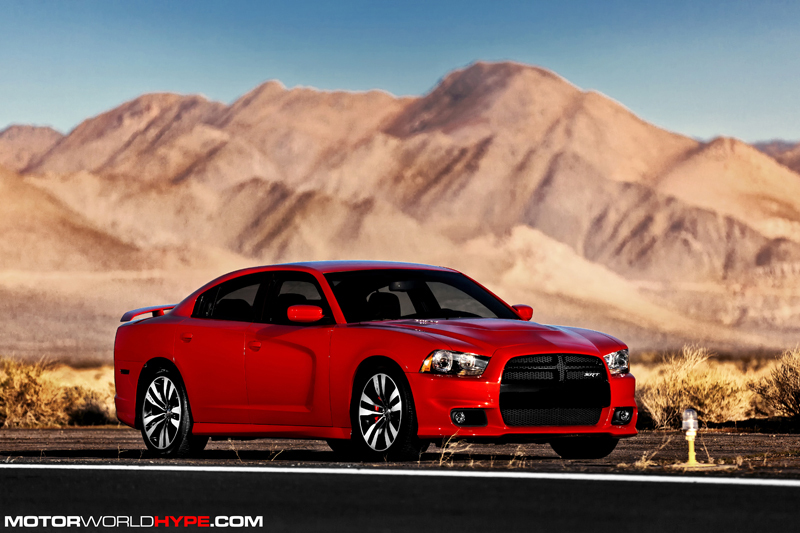 The new product onslaught continues for the Dodge brand with the announcement today at the Chicago Auto Show that the Dodge Charger SRT8 will return for the 2012 model year. 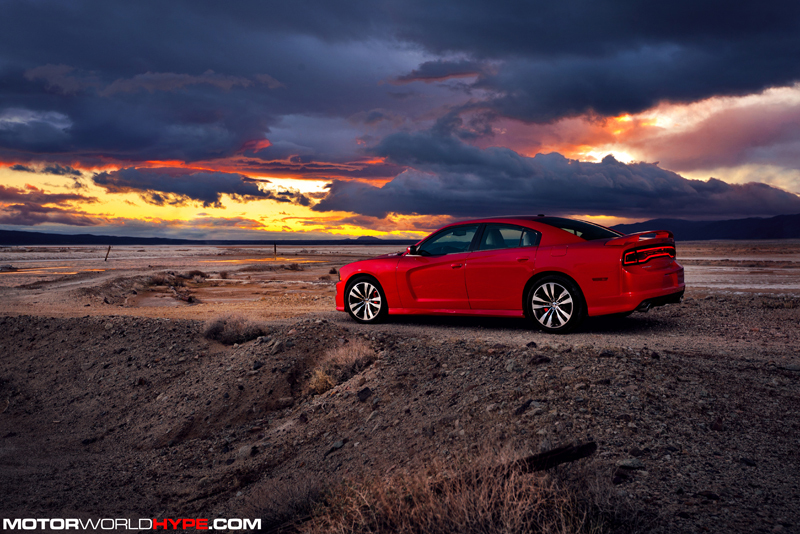 The 2012 Dodge Charger SRT8 will be built at the Brampton Assembly plant in Brampton, Ontario, Canada and will be in dealer showrooms later this year. Under the hood, the new 6.4-liter HEMI® V-8 delivers more horsepower and torque than the 6.1-liter HEMI V-8 it replaces. It also will offer improved fuel economy. 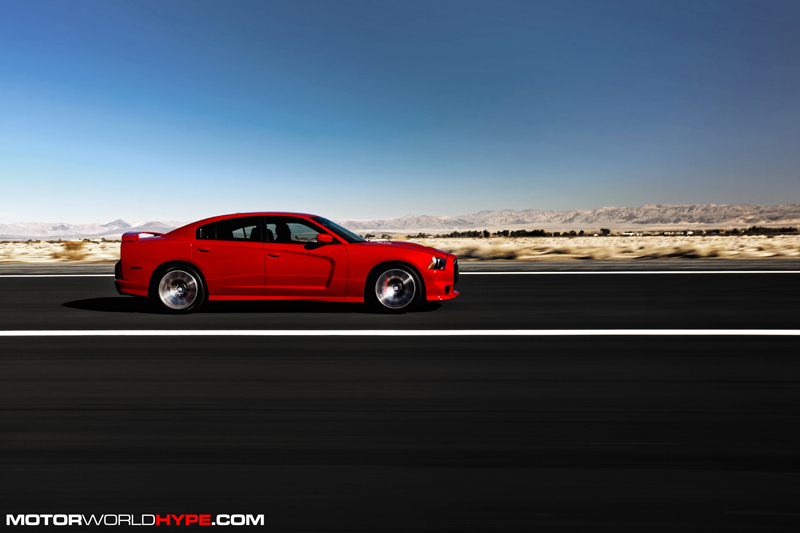 Estimated power ratings for the 2012 Dodge Charger SRT8 are 465 horsepower and 465 lb.-ft. of torque, including an estimated additional 80 lb.-ft. of torque at 2,900 rpm. Specific horsepower, torque and fuel economy numbers will be announced closer to the vehicle introduction. Building upon the standard Fuel Saver technology (four-cylinder mode) found in the new 6.4 HEMI V-8, a new for 2012 active valve exhaust system allows the technology to engage over a wider rpm range, which delivers improved fuel efficiency or the use of all eight cylinders when the power is needed. An active intake manifold and high-lift camshaft with cam phasing provides maximum low-end torque for impressive standing starts while optimizing high-end power. For the first time in any Chrysler Group LLC SRT product, standard paddle-shift technology joins the standard AutoStick on the floor shifter. Both are mated to the proven W5A580 five-speed automatic transmission, allowing a choice of spirited shifting on the road and the racetrack. Both shifting methods give the driver the ability to shift while the transmission controller calibration prevents situations that might over rev the engine. Fully adaptive electronic control of all shifting makes the powertrain more responsive while minimizing harshness. 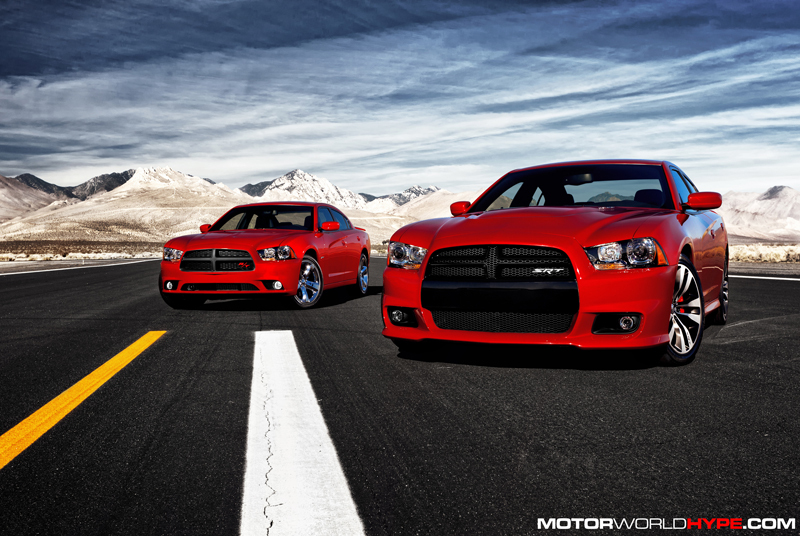 New for 2012, the Dodge Charger SRT8 features an adaptive damping suspension that uses a wide range of on-road and driver inputs, such as vehicle speed, steering angle, steering speed, brake torque, throttle position and lateral acceleration, to automatically tune the suspension for specific conditions. Drivers also can manually choose between “Auto” and “Sport” settings that quickly change the shock damping and harshness characteristics from the ease of everyday commuting to harsher, more challenging driving situations. World-class stopping power for the 2012 Dodge Charger SRT8 comes through four-piston Brembo calipers and vented/slotted rotors measuring 14.2 inches up front and 13.8 inches in the rear. Exclusive new front and rear fascias, along with a new rear spoiler, distinguish the 2012 Dodge Charger SRT8 with a high performance look. 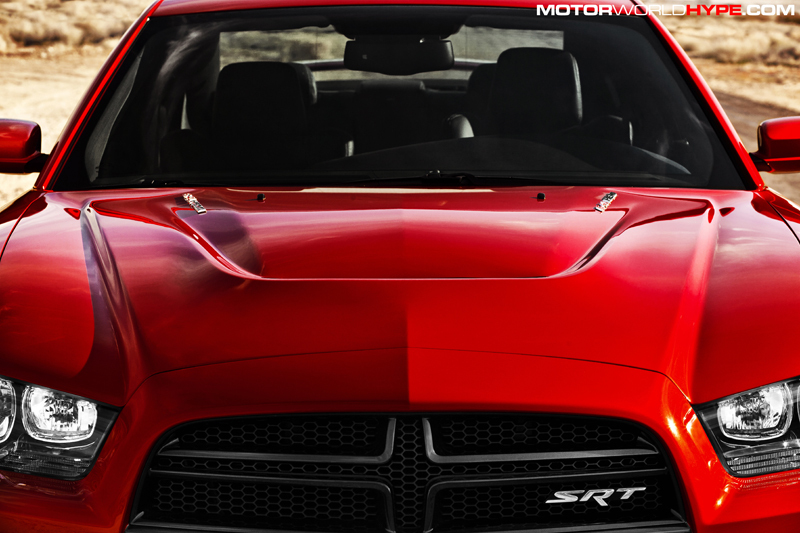 The front grille, grille surround and Dodge crosshair feature high-gloss black finishes and the SRT badge. A newly sculpted hood features a 6.4 L (liter) badge and black air exhauster for added engine cooling. In the rear, the Charger’s new signature “racetrack” taillamp design with 164 illuminating LEDs receives new 4-inch round dual exhaust tips and an SRT8 decklid badge to boldly show the Street and Racing Technology DNA. Unique side-sill cladding is painted to match the body color. A newly designed underbody belly pan features integrated brake ducting to improve cooling and brake fade performance at all four corners. 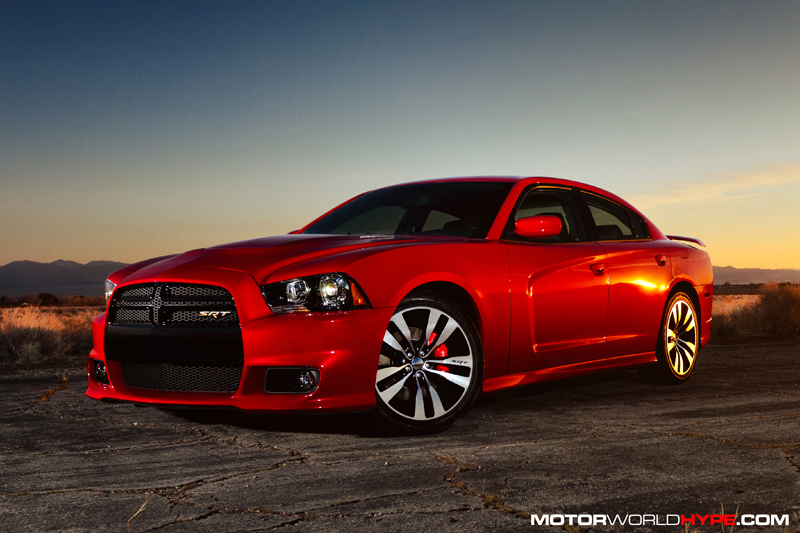 Building upon the all-new design from 2011, the interior environment of the 2012 Dodge Charger SRT8 combines more world-class accommodations with race-inspired technology and appointments. An all-new, leather-wrapped, SRT-exclusive steering wheel features a unique rim section with a flattened bottom surface that showcases the SRT logo. The standard paddle shifters flank both sides of the new steering wheel behind the new contoured palm rests. For the high-performance look, carbon-weave, fiber aluminum interior trim pieces are integrated into the new instrument panel and shifter bezel. The front seats have unique, aggressive bolstering and perforated suede insert fabric to help “grip” the driver and passengers, keeping them in place during spirited driving. Heated and ventilated front seats are standard. Reactive headrests also are standard. The SRT logo is embroidered in the seat backs. Rear seats also are heated for passenger comfort. 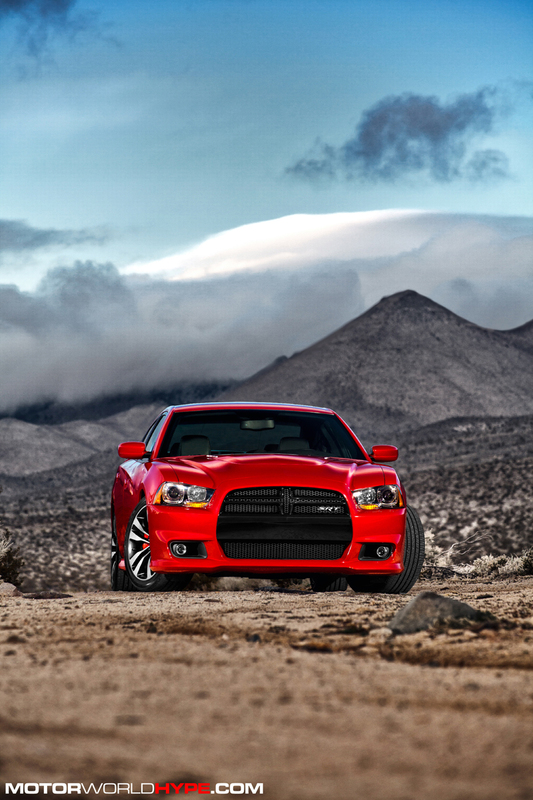 New for 2012, the Dodge Charger SRT8 features a 900-watt, 19-speaker premium SRT performance audio surround-sound system from Harmon Kardon. The intuitive user interface for the system is controlled through the state-of-the-art Uconnect® Touch on the largest standard touchscreen display (8.4-inch) in the segment. Benchmarked against the best E-segment sedans from Europe, Asia and North America, the easy-to-use system also features Uconnect Voice to deliver world-class functionality to keep all passengers easily connected, comfortable and secure. Exclusive Performance Pages are new for 2012 and included within the touchscreen display. The instrument panel display can be customized to view driver preferences and expanded to include instant feedback on steering input measurements, horsepower, torque, expanded engine information, along with 0-60 mph time, 60-0 braking, g-forces and one-eighth mile and quarter-mile times. The color graphic Electronic Vehicle Information Center also includes the Performance Pages timers and added engine information.